At its heart it’s all about this ‘citiness’, about contributing to the building and the culture of the city. The European city has proved itself the most fascinating receptacle for culture and perhaps it’s a bit of a cheek leaving stuff in the city for ever. But if you thought about it too earnestly, you’d freeze. Two hundred year old roof, Lake District UK. 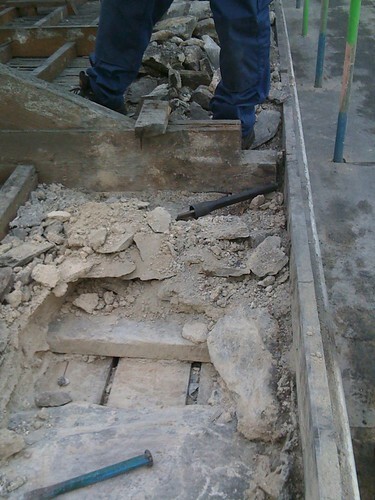 Lead dowel used to fix slates to battens. 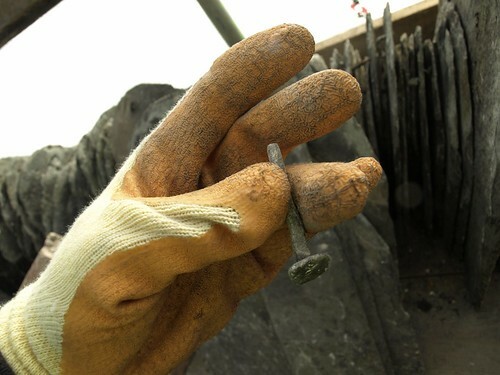 It is more usual to find timber dowels or iron nails. Westmorland slates reclaimed from the roof. Slates are tested for quality by their thickness, clean smooth cleavage, toughness to allow of holing for nails, and resistance to water. 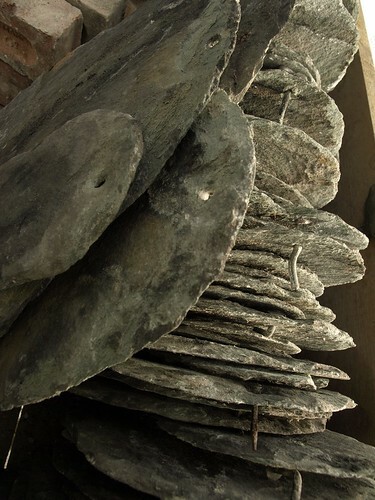 A good slate partially immersed in water should not absorb water to any appreciable extent above the water line…It should also give a clear ring when struck with the knuckles and when breathed upon or otherwise rendered moist, should not emit a clayey odour. A two hundred-year old roof, Lake District, UK. Nothing much to say – sometimes you are presented with the facts. How complicated can a simple roof be? 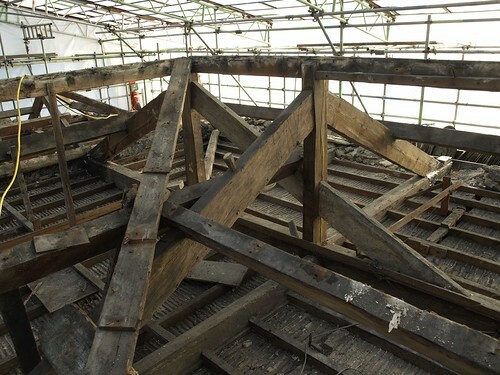 Main structure of king-post trusses and tie beams. Plaster and lath ceiling. 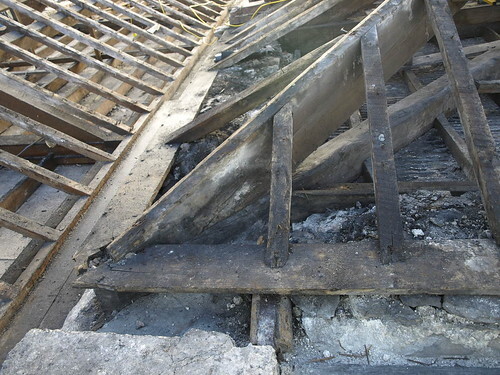 Spindly rafters laid flat; inch-thick board as wallplate. 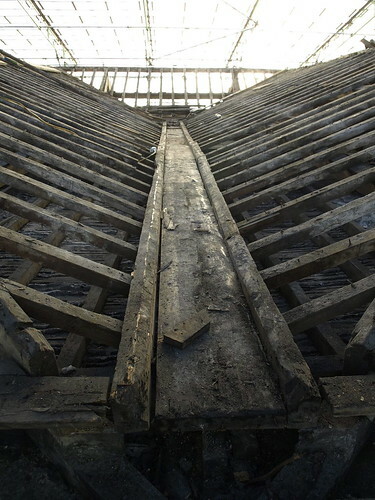 Note the shaping of the top of the hip rafters. View of window head structure from above: four four inch deep timber lintels side by side with slates above (‘through slates’) to tie the wall together. CiA are gratified to see the installation of a fraternal studio group at the University of Sheffield School of Architecture with their own blog. Studio One, under the tutorship of Russell Light will be exploring the theme of ‘Rome – Travel, Authenticity and the Past’. As well as the group of ancient worthies from the Capitoline Museum illustrated above, there will be an eager audience on the Lancastrian side of the Pennines following developments in Sheffield with keen interest. Iqbal Aalam’s flickr photostream includes some evocative slides from his 1967 trip to Kahn’s First Unitarian Church in Rochester NY (dedicated 2 December 1962). A commenter on the flickr site wonders whether Kahn’s building inspired the rooflights at Zumthor’s recently completed Kolumba Diocesan Museum in Cologne. than the spring loaded spools of tape in your bank and post office?